Just because it’s possible to do it alone, does not mean it’s a good idea for you. 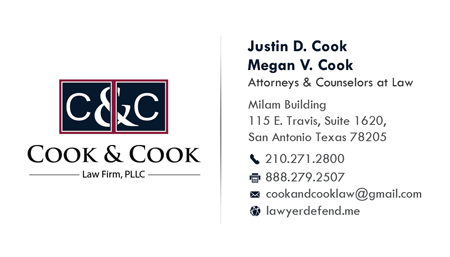 If you call my Office, and ask about the divorce process in Texas, I will be the first to tell you openly– YES, it is POSSIBLE to get divorced without a lawyer in Bexar County. But, there are some really good reasons why you should fork out the extra dough and hire a professional to handle the divorce for you instead. 1. It takes 6 to 8 Months to Get Divorced In Bexar County Without a Lawyer. Every week of my life as a lawyer, I have this conversation with someone: “Shouldn’t I just get divorced alone to save the $$$$?” Yes, you can, but it is going to take 6-8 months before your divorce is over. “No it is only going to take 60 days,” this person tells me. Then, I explain that while TEXAS has a mandatory rule that you wait 60 days from the date you file the divorce before you may be divorced, BEXAR COUNTY, will not arrange for your divorce to be final until 6-8 months until after you’ve filed the case. 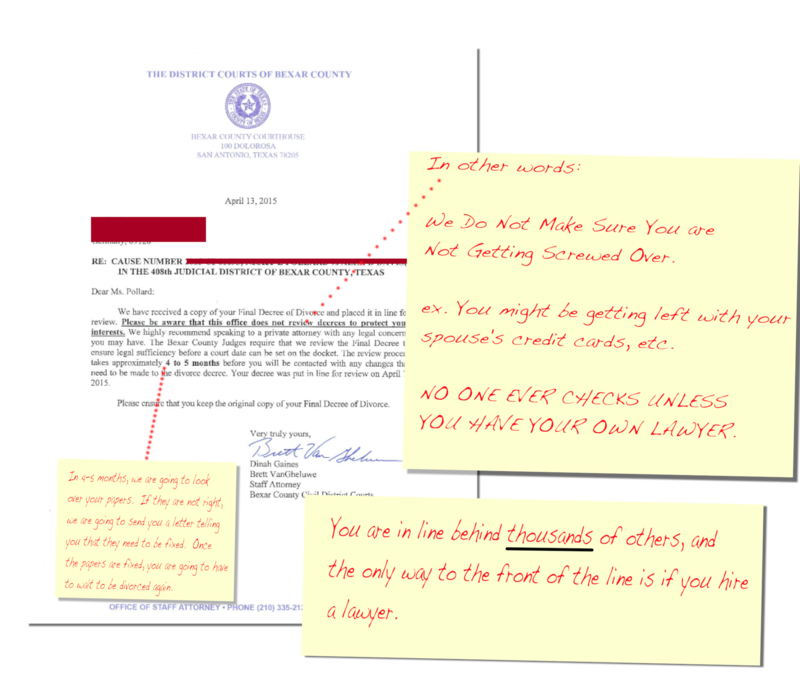 There are TWO things at play– TEXAS Law, and BEXAR COUNTY administration. Divorces without lawyers take 6-8 months. 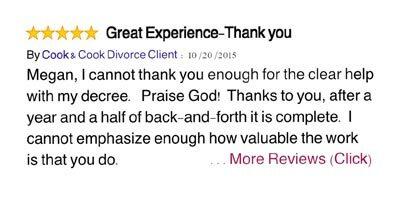 You go file your divorce, possibly using my bexar county divorce filing guide. You get your case filed and you feel like you are close to getting divorced. District clerk may reject your documents (in this case go home and start over) but if accepted will tell you to come back in 48 hours to file your waiver of service. go home and work on the decree of divorce (if done properly, this will usually take 1-3 hours and up to 5 hours). Have spouse sign the decree (if they refuse you cannot get divorced unless you take other steps, outside of the scope of this article) (usually this causes a long spousal meeting that is about 3 hours). go to court for a ten minute hearing. You may believe that there must be some sort of public lawyer takes care of you if you do not get a lawyer, but you are wrong. 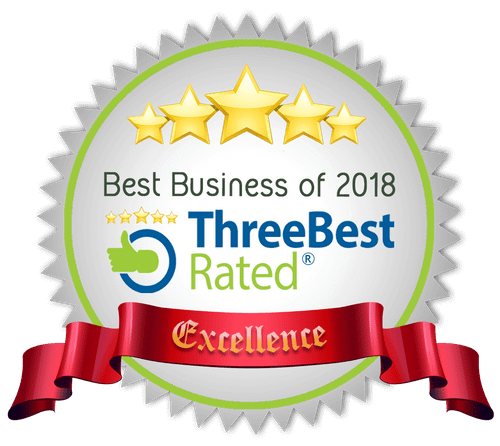 The staff attorney will specifically send you a letter, as depicted above that specifically says that they do not read the divorce papers to make sure that anything you wanted in your divorce is going to be given to you. You may be getting all of your spouse’s debts– debts that are wholly unknown to you. There are a lot of tricky things that can happen in divorce decrees that will cause you not to get what you think you are getting.  Article offers 4, of the many many reasons why you really should get a lawyer to get divorced. While it is tempting sometimes to save the money and go it alone, it is likely to cost far more in time, and failed effort than it costs to hire an inexpensive divorce lawyer to handle it for you!